Christmas Cookie Walk will be held at St. Nicholas Catholic Church, 4331 Capac Road, Capac on Saturday, December 15 at 9:00 a.m. Purchase a large tin for $9.00 and fill it with your choice of delicious homemade cookies. Come early for best selection! Call 810-395-2049 for more information. 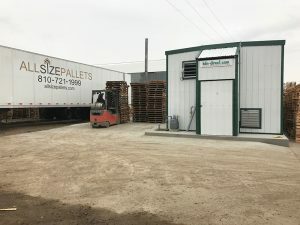 With the installation of the company’s second heat treatment kiln, All Size Pallets continues to live up to its goals of providing large-scale pallet services with small-business customer focus. The Kiln-Direct wide pallet kiln can treat 800 GMA pallets at a time and allows treated pallets to meet ISPM 15 requirements for both heat treatment and kiln dried certifications. To attain ISPM 15 certification, pallets must have been treated in a way to thoroughly remove any disease or insects within the wood. “Only pallets with this certification are allowed to be shipped internationally,” explained All Size Pallets owner Mike Kaminski. To meet heat treatment qualifications, pallets must have been heated to 132.8°F internally. Kiln drying also removes excess moisture in order to reduce weight and prevent wood warping. The kiln doesn't just help All Size Pallets keep its commitment to high quality. It will also help increase the company’s pallet output, raising the efficiency with which large and emergency orders are filled. “The new heat treat kiln will allow us to triple our output of ISPM certified heat-treated pallets,” said Kaminski. All Size Pallets looks forward to using these new facilities to continue its history of great service in the New Year. PLYMOUTH, MI, Nov. 30, 2016 – The Michigan Manufacturing Technology Center (The Center) has announced the addition of Bryan Luxon to its Business Solutions team. Luxon was named Senior Business Solutions Manager for the northern Metro Detroit region. The hiring announcement was made by Michael Coast, President of The Center. In his new position, Luxon will pinpoint the areas where manufacturers need improvement—ultimately enhancing both productivity and profitability. He brings 12 years of experience in the packaging industry and another 13 years in transport and logistics. Prior to joining The Center, Luxon was the Midwest Sales Manager for Sonoco Protective Solutions and specialized in automotive returnable packaging applications, cost-save redesigns with significant part-pack density elevations and Class A surface management. Luxon is a graduate of Oakland University and holds a number of postgraduate certificates. Luxon resides in Dryden, Mich. Celebrating its 25th anniversary, the Michigan Manufacturing Technology Center (The Center) is an organization dedicated to supporting Michigan manufacturers to work smarter, to compete and to prosper. The Center offers personalized consulting services to meet the needs of clients in virtually every aspect of their businesses. The Center is affiliated with the National Institute of Standards and Technology (NIST) and is part of the Hollings Manufacturing Extension Partnership (MEP Program). The Center also is closely affiliated with the Michigan Economic Development Corporation (MEDC) with the shared goal of making Michigan businesses vibrant, driving GDP growth, and creating new and lasting jobs. For more information, visit www.the-center.org. Saturday, December 10 at 9:00 a.m.
St. Nicholas Catholic Church, 4331 Capac Road, Capac, MI. Purchase a tin and fill it with your choice of delicious homemade cookies! It will be an Inside and outside event with new and gently used goods. Please come by and support your local VFW. Also looking for vendors. Call John at 810-542-0245 if interested. Jessica McLarty has joined CSB Bank as Assistant Vice President and Commercial Lender. Jessica has over 10 years of banking experience, most recently working in the Thumb area. Lapeer County Education and Technology Center Annual Open House on Monday, January 14, 2013 from 6-8pm. Our facility is open to parents and students of Lapeer County to check out our 21 programs and meet the instructors. Come and check us out! Please call (810)664-1124 for more information. Toy, Book & Movie Swap-- Just in time for Christmas! Saturday, December 1st the Great Start Parent Group will be hosting a Toy, Book & Movie Swap at North Branch Elementary School 10:00am to 1:00pm! Save money on presents this Christmas-- Bring your child's gently used toys, books & movies to our swap and earn FREE tickets to shop! Every ticket will be worth $1. The more you donate the more "money" you will make to put towards other toys!!! *Friday, Nov. 30th 6:00pm-8:00pm in the North Branch Elementary Cafeteria—Earn 5 extra tickets to shop if you drop off your items on Friday!! *No donations will be accepted after 9:00am Saturday, Dec.1st. No items to donate, but you still want to shop? NO problem. You can buy tickets at the door for just $1.00/ticket!!! Do you have so many items that you need to schedule a pick up? Call Vernee’ Charlebois at (810) 858-7214. Pick-ups will be made Monday Nov 26th, Wednesday Nov 28th & Thursday Nov 29th only. Shopping will begin at 10am and go until 1pm! Please share this event with your friends! The more people we get to participate the more happy children we will have Christmas Morning. Kindly join this event on Facebook and let us know what day/time you will be dropping off your items or RSVP to Vernee' Charlebois (810)858-7214 GreatStartLapeer@gmail.com. We are really hoping to help a lot of families this Christmas. Please help us spread the word! **If you are a service/business geared towards families with young children and you would like to be at this swap with a table to give information to the familes PLEASE conact me asap so I can get you set up. Employees of the former Hamill Manufacturing - Imlay CityPlant will gather for a 30-plus year reunion and family picnic in Attica. WHEN: 12-4 p.m., Sept. 16. WHERE: Attica Township Hall,4350 Peppermill Rd., Attica. DETAILS: Bring dish to pass and beverage; no alcohol please.